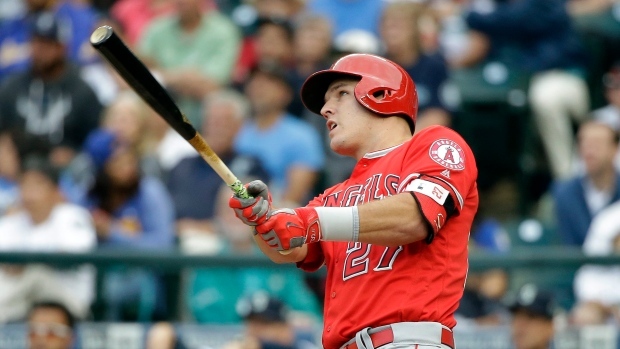 By the Numbers: Trout on pace to become greatest ever? He’s going to receive as much as $430 million over the next 12 seasons in what is by far the largest contract in North American sports history. It’s a lot of money, but if he plays anywhere to how he has over the first eight seasons of his career, it will be a bargain for the Los Angeles Angels. Given his production – as ridiculous as it sounds – it’s far to ask: is Mike Trout actually underpaid? According to Wins Above Replacement – an advanced stat that attempts to quantify how many more wins a player is worth when compared with an average minor leaguer at the same position – Trout has been more valuable than Bryce Harper and Manny Machado combined. And not just recently – for the past several years, too. Over 140 games last season, Trout was worth 9.8 WAR per FanGraphs. Machado came in at 6.2 and Harper at 3.5. Total over the past three seasons? Trout 26.4, Harper and Machado 26.3. Yet the value of Trout’s deal still comes about $200 million short of the other two. It isn’t a fair comparison for a number of reasons, but that’s been a theme throughout the course of Trout’s career – he really can’t be paralleled. The only players that come close to Trout’s statistical output through the first seven full seasons of their careers aren’t just in the Hall of Fame; they’re on baseball’s Mount Rushmore. 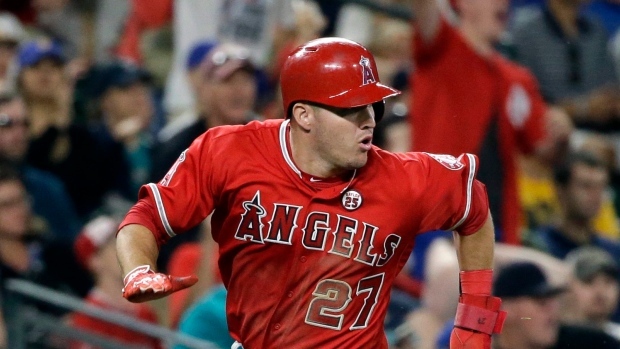 Fresh off a new record-breaking deal, TSN.ca takes a look at where Trout ranks among the game’s all-time greats and where he might end up when it’s all said and done. Let’s take a deep breath before going through Trout’s achievements. There’s just that many of them. At just 27 years of age, Trout is already a seven-time All-Star, a two-time MVP, a six-time Silver Slugger and a Rookie of the Year Award winner. He’s slashed .307/.416/.573 for his career and has been worth 64.2 WAR. From 2012 to 2018, Trout has averaged 34 home runs, 90 RBI, 26 stolen bases and an OPS of exactly 1.000. That’s a career-year for almost anybody. He’s hit 30 or more home runs five times and has led the league in both on-base percentage and OPS the past two seasons. Outside of his rookie season in 2011, he’s finished fourth or better in MVP-voting in every season he’s played. With all he’s achieved in his career, it could be argued that he’s only getting better. He had career-bests in walks (122), on-base percentage (.460) and OPS (1.088) in 2018. Amazingly enough, it hasn’t translated into success for his team. The Angels have made the playoffs just once in Tout’s career and were swept in three games by the Kansas City Royals in 2014. They’ve finished below .500 the past three seasons and are in tough once again this year in a deep American League West division. It’s almost impossible to hold Trout back, but his own team has found a way. Still, it didn’t stop the New Jersey native from committing long-term. “This is my home. 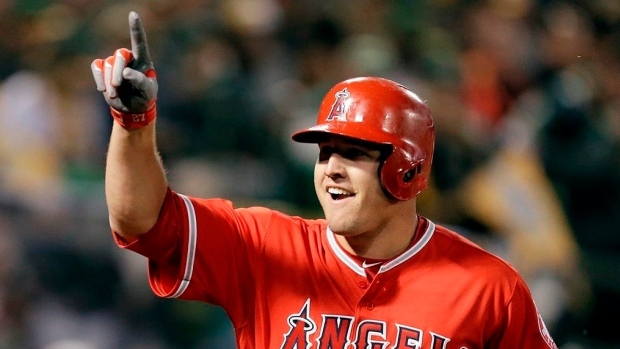 I love it,” Trout said over the weekend of his decision to stay. As the game moves one way, Trout moves the other. Teams across the big leagues have increased their strikeout rate in each of the past 13 seasons. In 2005, teams struck out an average of 6.3 times per game. Last year it was 8.48. But not Trout. After leading the league in whiffs (184) in 2014, Trout has remodelled his approach to average just 127 strikeouts over the last four seasons. He’s also increased his on-base percentage and home run totals in each of the previous three seasons. In other words, as baseball becomes more accepting of strikeouts in favour of swings meant to deliver the longball, Trout has cut down on the Ks and continues to hit the ball out of the park. It seems like the only thing that can slow him down are injuries, which he has battled in each of the last two seasons. From 2013 to 2016, Trout missed a grand total of 16 games. Over the last two years he’s missed 70. Trout injured his wrist sliding into third base last August and had surgery to correct a thumb injury after an errant slide the year before. Assuming these are blips on the radar – and given his durability throughout the rest of his career, they are – then there’s likely nothing to worry about. So the question becomes – what’s next? There’s a case to be made that Trout has improved in every season he’s played at the big league level. He won’t turn 28 until Aug. 7 so it’s possible Trout gets even better before the inevitable decline every player faces sometime in their 30s. But that won’t be for years. If he keeps up this pace (which he very well could) it becomes fair to ask: When do we consider Trout to be one of the best ever? Trout has a career WAR of 64.2. To put that in perspective, the average member of the Baseball Hall of Fame is worth 69 WAR. If things go the way they have his whole career, Trout projects to pass that at some point in the middle of this coming season. No position player has more WAR through his age-26 season than Trout. His 64.2 is already the best in Angels history with pitcher Chuck Finley sitting well behind in second at 52.1. Given his new contract, the gap is about to get a lot bigger. At 26 years and 318 days, only 35 players reached game No. 1,000 at a younger age, which Trout did on June 21 of last season. According to ESPN, Trout had 1,126 hits at the century mark, not far off the pace of Pete Rose (1,231), baseball’s all-time hit king. Buckle up because it gets better. Barry Bonds stands alone atop history’s home run list at 762, 172 of which he hit by his 1,000th game. Trout blows him out of the water at 224. Bonds, also baseball’s all-time leader in walks and WAR, is no match for Trout through 1,000 games in those categories either. Bonds had 603 walks and 50 WAR compared to Trout’s 638 and 61.7, respectively. 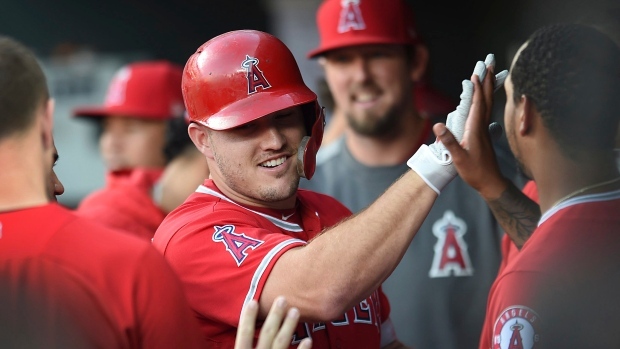 According to the Elias Sports Bureau, Trout is only one of three players to have a career batting average of at least .300, 450 extra-base hits and 150 steals in their first 1,000 games. The others? Willie Mays and Alex Rodriguez. But it’s what he done through his first seven full seasons that might be the most impressive compared to some of the greats from the past shown in the table below. He might not end up as the best to ever do it, but he’s at least on pace to be in the conversation. Now it’s up to the Angels to surround him with talent capable of giving him the one thing his legacy doesn’t have yet – a World Series.